It's been a while since our last xlwings newsletter. We've been busy in the meantime and since we're growing and have a lot more to offer than just xlwings, we've turned the xlwings newsletter into a broader Zoomer Analytics newsletter. You will still get all the news about xlwings, but we will also cover our other products and projects and occasionally write about interesting technology that we come across when building web apps for finance, our core business. Don't forget to follow us on twitter if you want to hear from us more often than via this newsletter. Since the last xlwings newsletter, we've released 4 minor versions (v0.10.1-0.10.4): they are mostly bug fix releases but also add more power to User Defined Functions. Support for Python 3.6 has been added, too. Get the detailed changelog here. 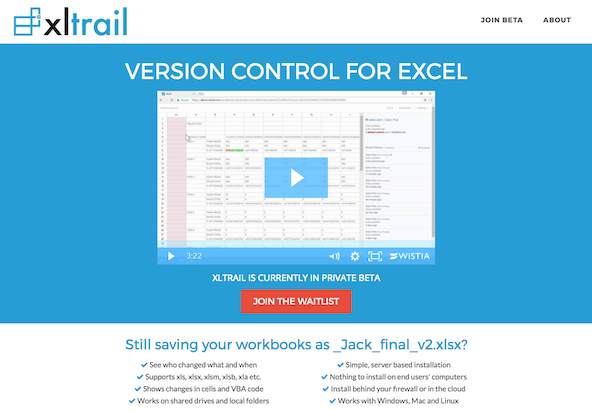 We're excited to announce xltrail, our next generation version control system for Microsoft Excel. There are still a few months to go until we're ready for private beta, but you can already put yourself on the wait list: https://www.xltrail.com. xltrail (formerly Pathio and Spreadgit) is an on-premise enterprise solution and will be free during beta.